Recently I have written a series of pieces that are concerned in one way or another with the presentation of unique, and yet similar, events or objects. For example, in fifty objects (2007, for ensemble) and individual objects (2009, for orchestra), I made a sequence of unique musical objects that are closely related; forty objects (2007, for 40 electric guitars) has 40 independent parts; and in over 5000 individual works (2007, for piano) a single performance, or individual work, is one of 5040 versions of the piece. 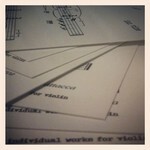 In  individual works for violin, each performance is potentially a world premiere. The performer is encouraged to select five cards from seven, and then the order in which those five are played - the list of 2520 possible orders can be found below. The title should be changed to reflect the order, for example: individual works for violin #1056. Players can look up their performance order [by using the 'find' function in most browsers] and log a world premiere by contacting the composer. As with over 5000 individual works, this piece partially takes its title from sculptures by New York artist Allan McCollum: Over Ten Thousand Individual Works (1987/88) is a collection of unique pieces made from casts of ordinary objects that are combined to form an Individual Work.